It was a bitterly cold Autumn day. I had dragged Mr NQN all over the city and I could tell that he was tiring of my antics as a storm started to gather on his face. "Do you want dumplings?" I asked and he smiled broadly, like sunshine bursting through clouds. Chinatown Noodle Restaurant is a prosaically named restaurant on Bathurst Street near Town Hall. Every time we've gone past it has always been very busy with huge queues. It's not quite in the thick of Chinatown but close enough to the action to mean serious queues. The in-between eating hour of 3pm is also not an ideal one but it also means that we can finally get a table here. Because if you come here after 6:30pm on a weeknight, even a Monday you can expect to wait for a table. There are plates of food on empty tables. That's the staff meal awaiting the staff. 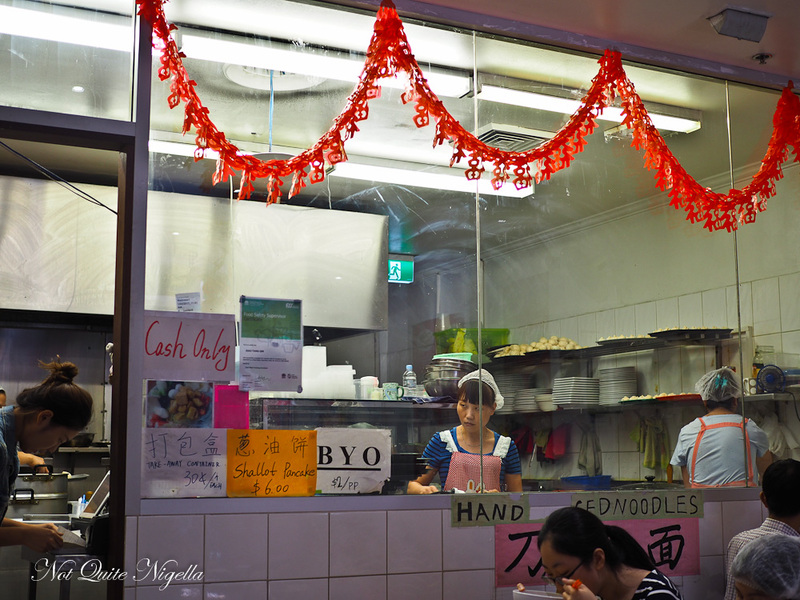 They're all behind the glass open fronted kitchen, stretching noodles and pleating dumplings. We sit down and are offered a laminated double sided menu. Dumplings on the front, meat dishes on the other side. There are hand written signs. Cash Only. Takeaway Containers 30C. Shallot pancake $6. 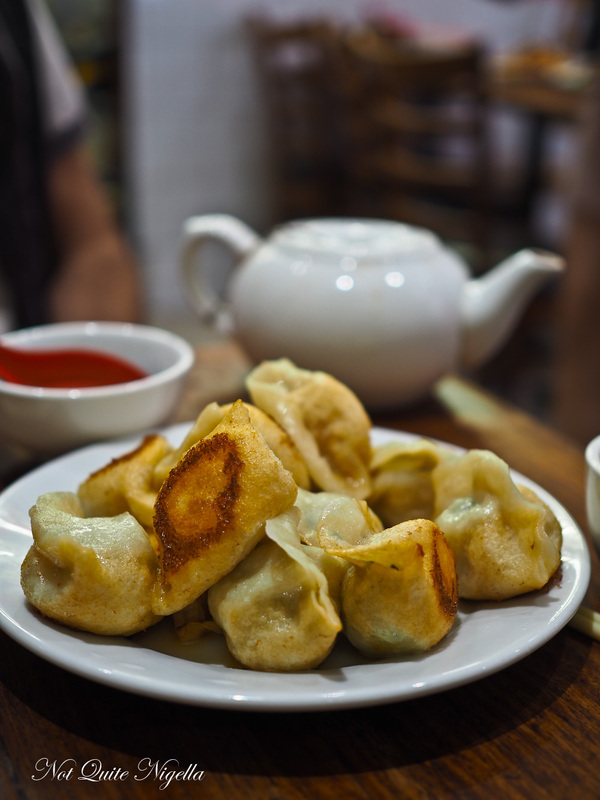 Tea is furnished and we order a few things and within no more than 2 minutes a plate of crispy bottomed pan fried dumplings arrive. We ordered the pork and chives ones but there are pork and Chinese cabbage, pork and seafood, lamb and carrot, egg chives, lamb and celery, beef shallot etc. They're super hot and once they cool down they're so satisfying in the way that a bite sized morsel of carbs and meat is on a cold day. Dumplings can power a nation I'm sure of that. The noodles arrive and they're fantastic specimens. Chewy and springy and each one a slightly different thickness due to their hand made nature they're served with our choice of seafood and a saucy glaze. I just want the whole plate thank you very much. When we asked for recommendations they asked if we liked spicy. Yes. Even more so on a cold day. 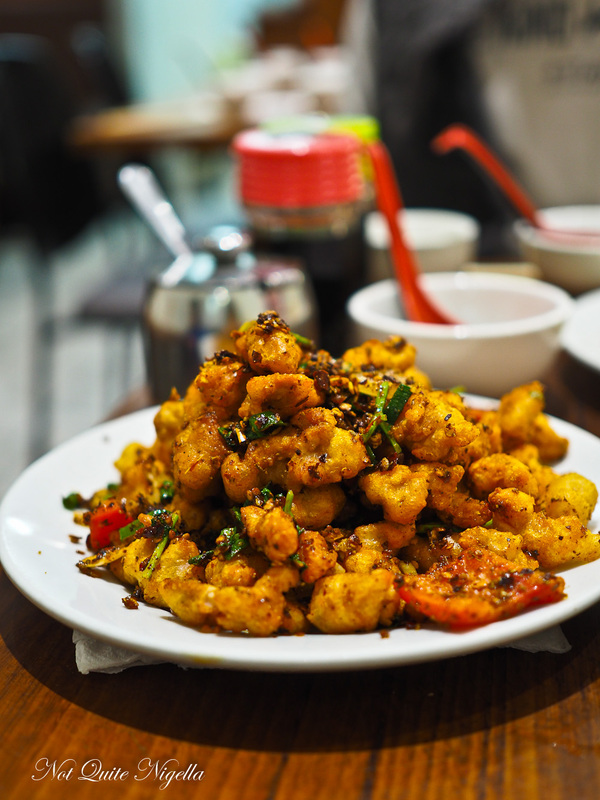 The spicy chilli chicken is small pieces of lightly battered chicken with capsicum, onion and lots of chilli flakes. It's hot but not palate burning hot and needs a serve of rice to give it a bit of balance. While we eat the staff leave the kitchen to pull up chairs and eat their food. They're constantly interrupted by new customers. As soon as a woman sits down to eat another walks in and she points them to a table. Another woman who eats just two bites goes straight back into the kitchen to cook. The cold weather necessitates a return visit and even on a Monday night we slide in in the nick of time before a queue forms at 6:30pm. 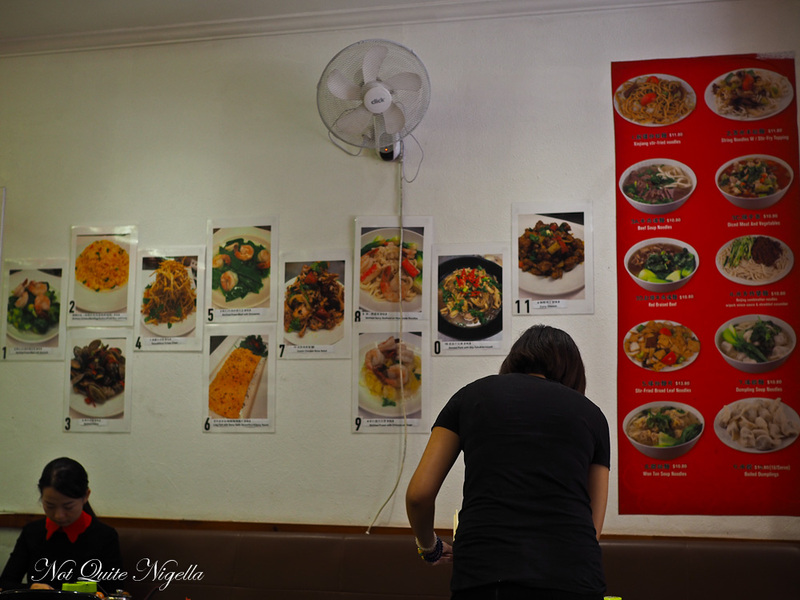 We take a closer look at the noodle menu. There are lots of types of noodles and it's a bit difficult to see what the difference is between them. 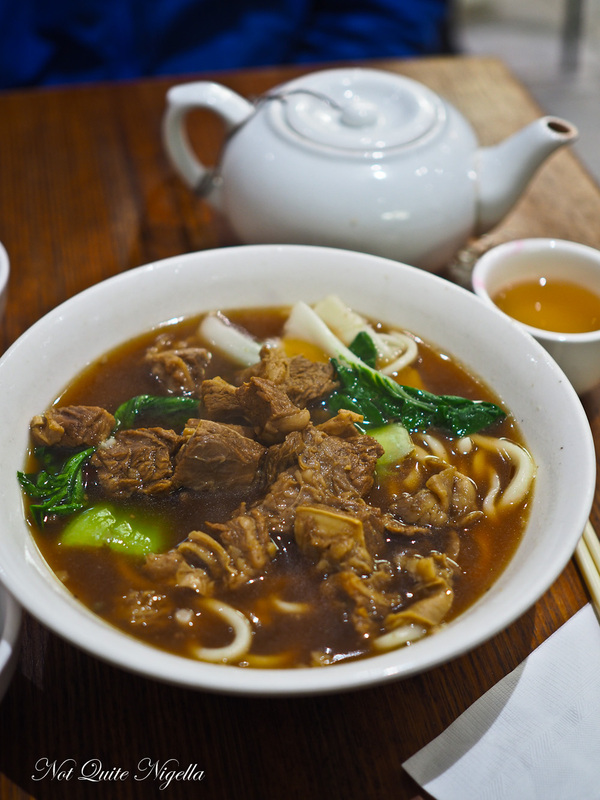 We go for a bowl of steaming hot soup noodles with red braised beef and bok choy. The soup is warming and layered in flavour, and I particularly like the soft melting pieces of beef fragrant in star anise and the chewy texture of the noodles although I have to say that once they've been sitting in the bowl for 10 minutes the chewiness disappears as they soak up the broth. The steamed pork buns are bit of a blip on the ordering radar. 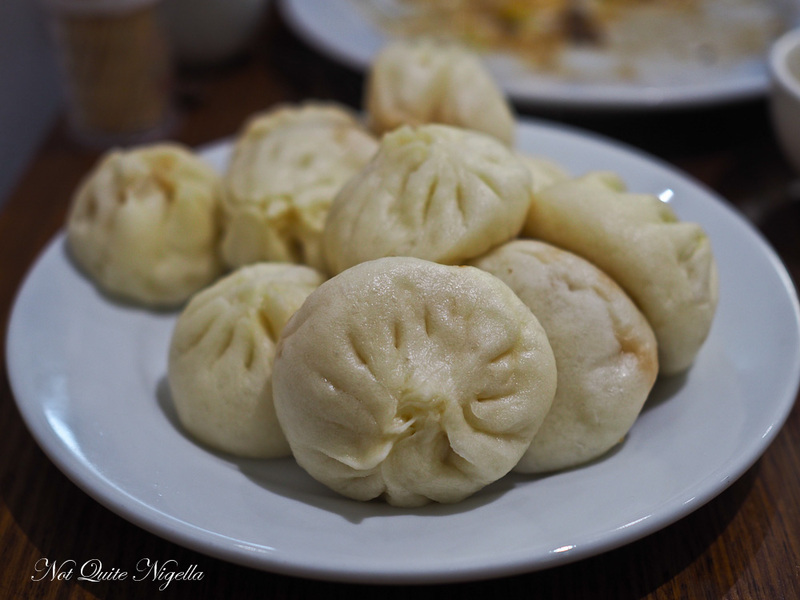 What we were told were xiao long bao aren't actually XLB, they're the steamed version of the puffy pan fried dumplings. These are a bit boring and there's no soup in these and the pudgy dough buns really do benefit from pan frying. We were feeling all the noodles that evening and I was curious to see what the leaf noodle dish was. 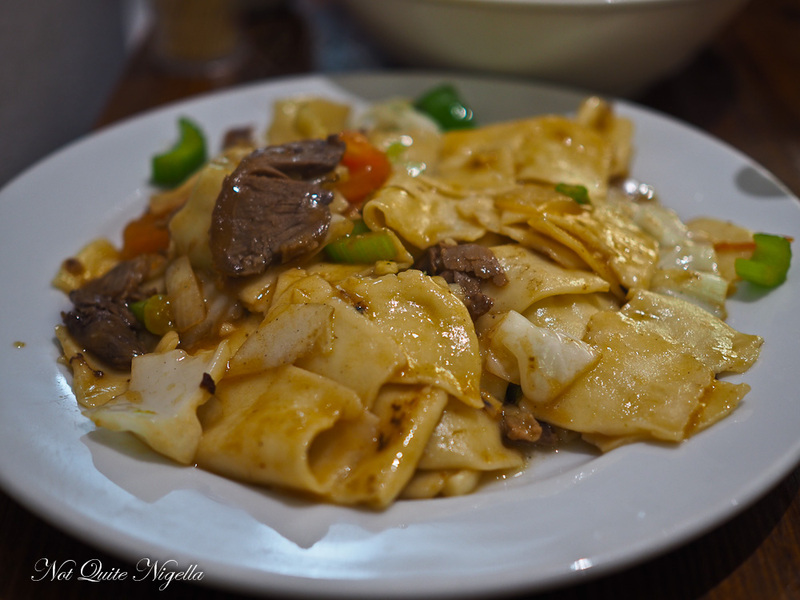 They're not quite leaf shaped, more thicker wheat based noodles and we ordered these with beef. I really do love the chewier texture of thicker noodles like this although this does need a bit of pep from the chilli oil on the table. I leave Mr NQN to finish everything up on the plates and he does so gleefully. 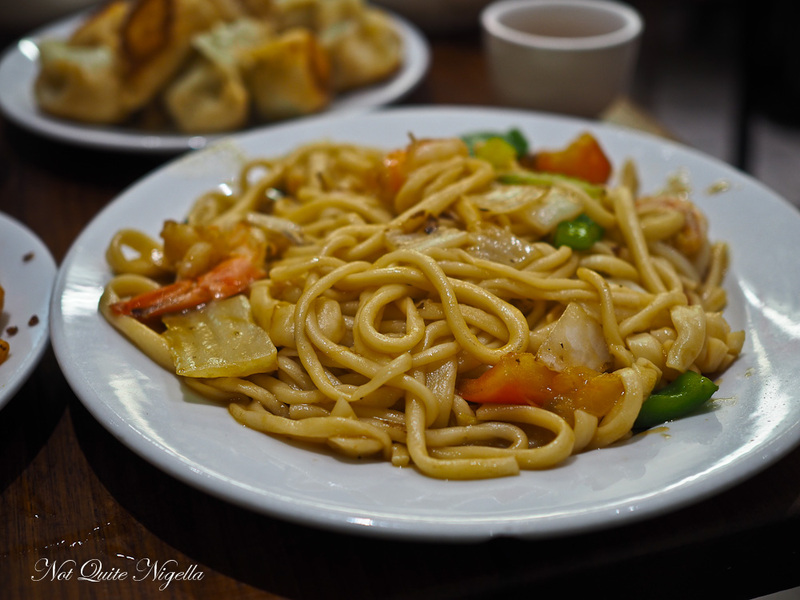 So tell me Dear Reader, do you prefer thick or thin noodles? Do you have a favourite kind? And are you team steamed or team pan fried for dumplings? These meals were independently paid for. restaurantLady Gaga Meets The Spice Girls At Spice World! restaurantA Family Birthday at Lotus, Barangaroo! 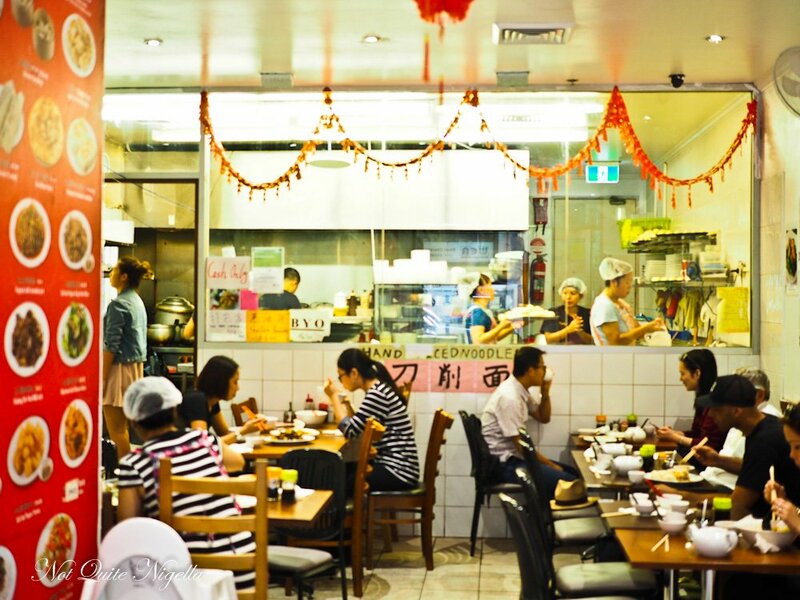 restaurantDainty Sichuan Noodle Express Comes To Sydney! restaurant Lady Gaga Meets The Spice Girls At Spice World! restaurant A Family Birthday at Lotus, Barangaroo! 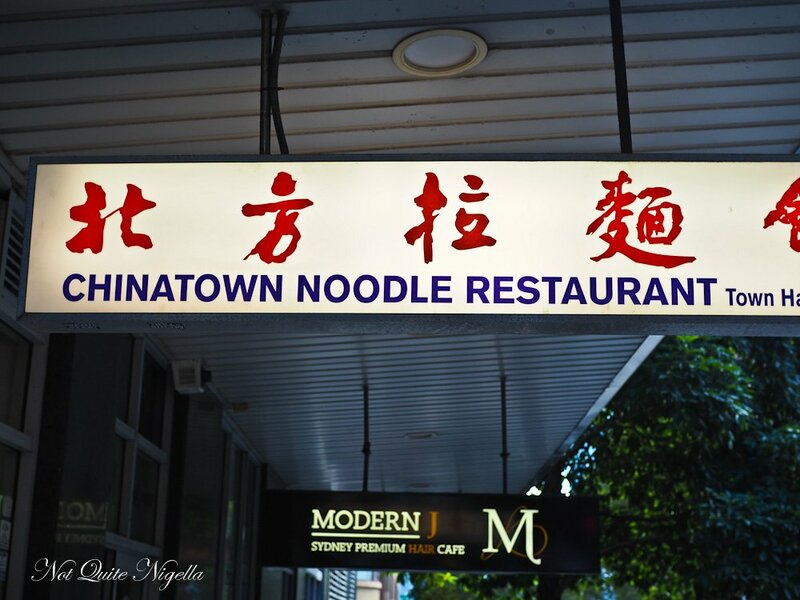 restaurant Dainty Sichuan Noodle Express Comes To Sydney!